Our son was born healthy in January 2004. Since August 2005 we know that he has TPA in the right lower leg (Tibia) and the suspicion exists that he will develop Neurofibromatosis. Since this time until 2007 he has used orthopaedic aids. For the first 6 weeks he was in a plaster, then he received an orthopaedic aid which held on the condylus (knee). On 5.6.08 he underwent a major operation to have a Prevot nail inserted and the plan was for the following 6-9 months to use a Taylor Spatial Frame (Fixateur Externe). But after 2.5 months the frame needed to be removed, because the pins did not hold and he had slight infections at the entry points of the nails. On 21.8.08 everything was removed and he was given an upper leg plaster. Additionally during the 4 months he developed an extended growth of 2.5 cm. In the meantime a few months have passed. On 1.12.08 the titanium nail was shortend to support and speed up the healing. To our disappointment this didn’t happen and Severin got worse and worse since January 2009. On 11.2.09 the doctors decided to shorten the orthopaedic aid to enable contact with the floor in order to encourage a better circulation of the leg as well as increase in mobility. Despite this change Severins walking pattern or posture have not improved. On top of it all we had a ski accident on our ski holiday (Mama was unable to break the sledge) and Severin cannot put any weight on his leg anymore, he is now walking on crutches all the time. After a visit to the clinic we received confirmation that the deformation of the bone has increased and the density of the callus has deteriorated. It was discussed if the same operation should be done as last June. After our doctor consulted with Prof. Grill in Vienna he decided to drag out the operation another 2-3 years with the help of an upper leg orthopaedic aid. In the hope that Severin can walk without any pain for the next 3 months. Should that not be the case then another operation has to happen this sommer. luckily it is not very complicated and we strongly hope that Severin can accept this orthopaedic aid and be able to walk and be painfree. We have the new orthopaedic aid since yesterday. We still need a lot of exercise to put it on but we are getting better each time we try. The curving of the bone has gone worse despite the orthopaedic aid. According to the doctors this should not be a problem, they say the bone is supported by the nail from the inside and by the orthopaedic aid from the outside. Unfortunately the curving is going worse and they had to stabilizd the orthopaedic aid with a lock joint. This means that he is now walking with a stiff leg, if he wants to sit or get dressed he can open the joint so he can bend his knee. Since 2 weeks he has been given a wheelchair so he can move around independently. Long distances are impossible with a stiff leg or on crutches. For the moment we will continue in this way as long as the painlevels of Severin allow us to. Should the pain go worse another operation will remove the affected bone area (appr. 10cm) and they will stabilize it again with a Fixateur; which will straighten the bone over several months. There is a 50-75% healing rate, but at the moment he is doing very well. being that the nail is nearly breaking through the bone, also the Fibula broke a few weeks ago. Due to no proper healing both bones are now affected (Tibia & Fibula). The main issue though is the Tibia. The Doctors are discussing a Segmenttransport which would mean a longer Fix-Ex time. 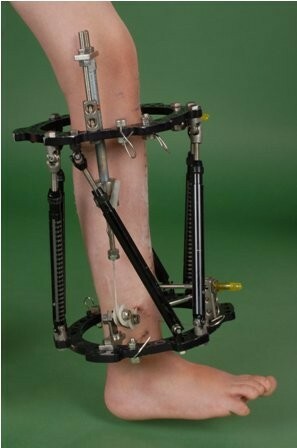 The fibula transfer methode will only be used if nothing else works. Through MRT scans the doctors have determined a 50% chance for the Fix-Ex methode and a 75% chance for the segmenttransport methode. One of the reasons for this is the massive overgrowth of his right leg, despite the enormous curving the leg is 3cm longer. In June 08 they managed to get both legs the same lenght, but now 1.5 years later there is an overgrowth of 3-5cm. We will see how this will develop further. At the moment Severin is attending wheelchair sports in a youth sports group and he is very happy. We now have a date for the operation on the 1.3.10. 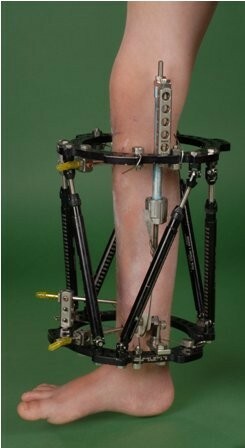 They will do the Segmenttransport and they will straighten the bone from top to bottom. Because the lower bone is not so good, they will use the upper bone, because it is nice and strong. Hospital stay up to 3 weeks. During the straightening time he cannot put weight on the leg, but during the building up period he can put light weight on the leg. Straightening time appr. 2 months, building up time 3 times as long, so we are looking at about 8 months of Fix-Ex time. That sounds terrible and we are struggling for the last few days to come to terms with it. But now we are getting used to the new situation and we know what’s going to happen as we have gone through the same thing in 2008. At the moment we are very worried about his current condition. Since Saturday afternoon he has a temperatur of 37.5 to 38.5 degrees and sometimes his leg is red, swollen and hot. His lymphnodes are only slightly swollen in his groin and I am not sure if it is the leg or if he his coming down with the flu. He has increase in pain and that could lead to a higher temperature. We are letting him stay at home at the moment and he is resting with an elevated leg. Only a few days left until the operation, he has to be in hospital on 26.2.10 and he will be operated on in the early morning of 1.3.10. We are looking at 4-10 weeks in hospital all depending on how much they remove and how quickly the bone will re-grow. 1.3.10 operation started 7.15am, 2pm he is in the recovery room. The PDA has not taken fully on the right leg but very good on the left leg. They removed the whole PA area and now 7cm are missing. 2.3. the PDA was removed by 1 cm in the hope that it works better. Unfortunately only a minimal improvement. In the afternoon we had a visit by the hospital clown from the Theodora foundation, this was balm to Severins soul. Severin was able to forget his pain for a little while. 3.3. We are in the recovery room and through an anaesthetic injection into the PDA the pain miraculously dissapeared. This helped to make the change of bandages and the cleaning of the Fixateur painless. 5.3. All access incl PDA was removed. With Ponstan, Dafalgan and Tramaldrops he is doing well. Even the pincare he manages very well without too much resistance (thanks to Nintendo) He is now much more mobile again. Since 15.3.10 they did the Segmentransport. After that for under 2 weeks just a 1/2mm to give the bone more time. Since a week we are now back to 1mm, uptil now we have achieved 15mm. The pain is not too bad, he feels a pull from time to time but he is doing so well. In the last few days the pins don’t look so good any more especially one of them. With the use of a short anaesthetic this was cut open and cleaned thouroughly. He has been put on a course of antibiotics and until tomorrow he has a drip; then the worst should be over. It isn’t a big infection and thanks to still being in hospital they where able to catch the infection early and treat it. Hopefully tomorrow we can enjoy Easter at home. That will do him the world of good even with the view that he has to go back to hospital on Monday night. Our son is at home since Thursday the 10.6.10. 23.5.10 the lengthening of the segment was complete and the deformation of the lower bone was corrected. Through the correction and the lengthening process the parts have shifted slightly in behind each other, this caused an irritation of the tissues. For the first time he has a lot of pain again, but within 6 days it started to quieten down. It was the only time that he had a lot of pain, for the most part of the Segmenttransport he had very little pain. Thank God the worry that he would end up with a pointy foot has not become a reality; thanks to physiotherapy and the foot inlay he wears at night. Now he shall slowly, through floor contact and and the help of his crutches, start to walk again; this will encourage the circulation in his bones and aid with the formation of callus. He will wear the Fix-Ex for many more months probably till Christmas.